We hope you’re having a fantastic start to your school year! A new school year provides an exciting opportunity – to reconnect with friends, dive into coursework, discover new passions – and most importantly, to be back on campus, mobilizing and collaborating with peers around crucial collective action. As the school year begins, student activism also returns in full force. Given our current reprehensible political climate, we need your advocacy and activism now more than ever! If you’re interested in working on social justice and feminist issues but you’re unsure where to begin or how to get more involved, join your campus feminist group! If you don’t have a feminist group on campus, now’s the time to start one, and we are here to help! 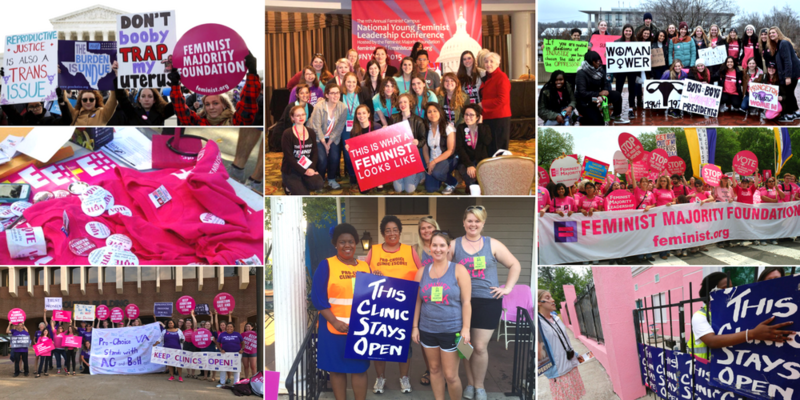 Stay connected to a national network of activists by affiliating your group with the Feminist Majority Foundation’s Feminist Campus Campaign. If you’ve already graduated, your college career may have ended, but your convictions and determination endure. Remain engaged with activism and build power with badass folks all over the country (and world!) by joining our Feminist Campus Alumni Group. If you and your group are already back to work, tell us about it! Whether you’re fighting to protect a local health clinic, exposing CPC’s, working to register youth voters, or organizing around issues specific to your college/community, we want to hear about what you’re doing. Additionally, help us help you better! Send feedback or thoughts about how we can better serve as a resource to your group by emailing us or filling out this survey. Finally, save the date for our annual National Young Feminist Leadership Conference, March 17-19, 2018 in Washington DC! Check out our website for more details! All of the campus organizers are so excited to connect, learn about current campus efforts underway, and offer any support you may need this year! Please do not hesitate to contact the team to share ideas, ask questions, or seek guidance. We look forward to working with you all this year in our continued fight for justice.